Free Shipping Included! 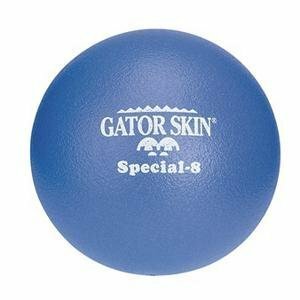 8'' Gator Skin Special Ball-Blue by Gator Skin at Scruffs Game. MPN: LYSB0027Y555C-SPRTSEQIP. Hurry! Limited time offer. Offer valid only while supplies last. Medium bounce. 8'', 40 kg. Best suited for middle and high school aged kids or where a heavier ball is required for throwing. Certified Latex Free. Medium bounce. 8", 40 kg. Best suited for middle and high school aged kids or where a heavier ball is required for throwing. Certified Latex Free. Non-sting coating is a proprietary polyurethane. The tactile, non-sting coating makes these Gator Skin balls easy to grip, and the coating is so durable, they're virtually tear-proof! No more red marks from the stinging hit of a vinyl- coated or rubber ball, so everyone can play at ease and gain confidence. That means more fun during more activities. Our premium Gator Skin® balls are simply your BEST choice. Our premium Gator Skin® balls. Safer than vinyl-coated or rubber balls. If you have any questions about this product by Gator Skin, contact us by completing and submitting the form below. If you are looking for a specif part number, please include it with your message.